This time of year is a bit of a slump for those of us that like working out in the yard. When we'd like to be outside digging around in the dirt and rocks, we have to be inside by the fire drinking a boring cup of cocoa. But what I do like about this time of year is the free time that I find myself with. I'll plant my self on the couch with my laptop and dream about gardening and landscaping by reading articles, news, and blogs pertaining to landscaping and lawn care. 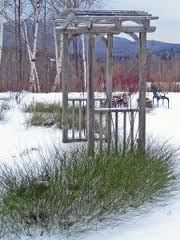 I came across a cool post by Dr. Larry Perry about Choosing Plants with Attractive Bark for Winter Landscapes. 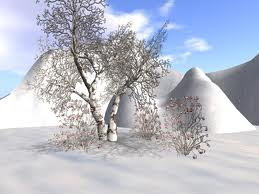 The short, grey days of winter in the north, coupled with snow, often create landscapes that resemble a black and white photo. 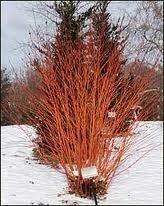 Winter landscapes need not be drab and dreary, and can have color, by choosing plants for interesting bark. As a beginner gardener and aurborneer, I would never have thought about this concept. Obviously winter is not the brightest of seasons, which might be why we insist on decorating our houses with bright colored lights and decorations. But why not choose plants with attractive bark so when winter rolls around, your trees add to the color and beauty of your yard? I think it's a great idea. For those of you that speak Plant, The genus Cornus is a group of about 30-60 species of woody plants in the family Cornaceae, commonly known as dogwoods. 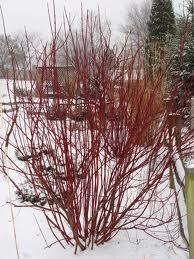 Most dogwoods are deciduous trees or shrubs. I like the reds, oranges, and yellows these plants produce. Apparently they get really bright in the winter time and then green up once spring sets in. Really cool. 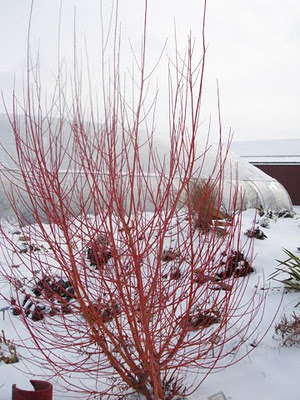 Whatever the selection you choose of the bright-stemmed dogwoods, the color may be more green in summer, turning bright in winter, then back to more green next spring. 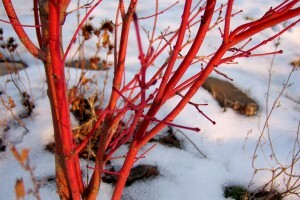 Color is brightest on year-old stems, so the key to keeping good color is pruning back the oldest stems each spring so new ones will develop that growing season. 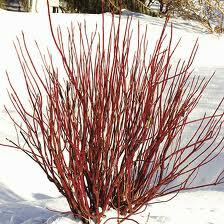 Shrub dogwoods are hardy, and quite vigorous given full sun (but can tolerate some shade), and can be pruned to within a few inches of the ground to renew overgrown bushes. They are adaptable to many soils, tolerating wet ones and even drought once established. I like to use their stems in holiday arrangements. You can't really tell, but the Rosa Glauca has little berries on the ends of the stems that really make the entire plant come alive! Maybe some day I will have one of those in my backyard! The Kerria Japonica is awesome because it stays green all winter long without needing any water so you won't have to worry about watering it with an Orbit Hose Timer or mowing with a lawn mower! Pretty cool! The Coral Bark Japanese Maple (picture at top of page) is not one that Dr. Perry mentioned but it is also a very popular winter plant because of how bright it gets. So consider these when choosing plants for you landscape! You will be able to enjoy them all year round.